It is that time of year again…I cannot believe that I have been at the University of Oregon for nigh a whole quarter. There are only a couple of weeks of the autumn term left and course descriptions for the winter are due (as are those pesky book orders). I am only teaching one course in the winter; it is supposed to be my “research quarter” where I will get all sorts of scholarly work done! I am teaching WGS 361: Gender in Film, Television, and Media (the last part I added). 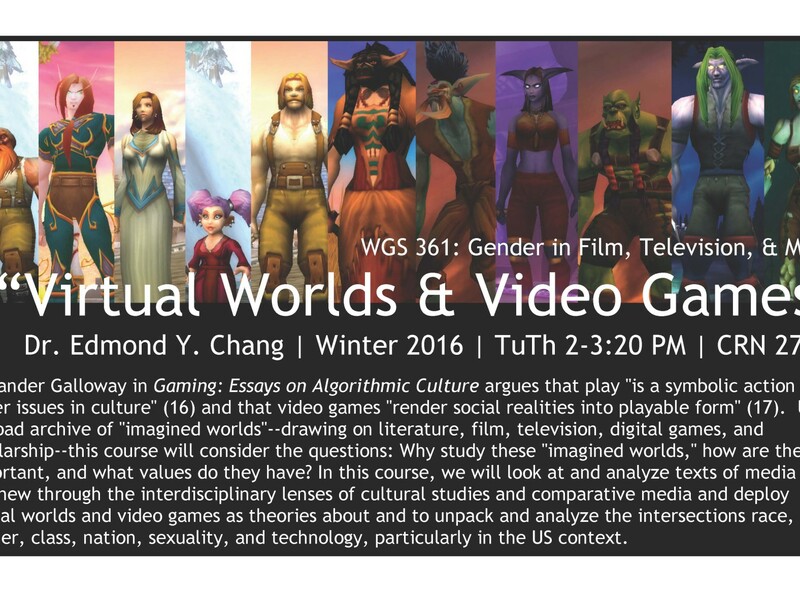 I will be teaching a version of my “Virtual Worlds & Video Games” class. The current description is pretty general, but I think I will be retailoring the course to directly address the backlash against women, queers, people of color, and other non-normative difference in games, gaming communities, and the gaming industry. Plus, I want the course to count toward the Queer Studies minor, so I will need to make sure to dedicate at least half the time toward issues of sexuality, desire, trans* studies, and intersectionality. Alexander Galloway in Gaming: Essays on Algorithmic Culture argues that play “is a symbolic action for larger issues in culture” (16) and that video games “render social realities into playable form” (17). Using a broad archive of “imagined worlds”–drawing on literature, film, television, digital games, and scholarship–this course will consider the questions: Why study these “imagined worlds,” how are they important, and what values do they have? In this course, we will look at and analyze texts of media old and new through the interdisciplinary lenses of cultural studies and comparative media and deploy virtual worlds and video games as theories about and to unpack and analyze the intersections race, gender, class, nation, sexuality, and technology, particularly in the US context. This entry was posted in #thirdyearfaculty, Courses, Gaming, Teaching and tagged 361, UO, video games, virtual worlds, WGS. Bookmark the permalink.